Lately it seams like each day is split right down the middle with bad weather in the morning and great weather in the middle of the day. Yet another day with limits of rockfish for our 7 passengers and crew after an hour and a half of fishing. Fishing has been great locally here in Monterey. There has been a lot of anchovies near the reef, so we have been fishing without bait which has been working out just fine for us. With limits of fish in tow, it was time for another session of pulling crab gear. 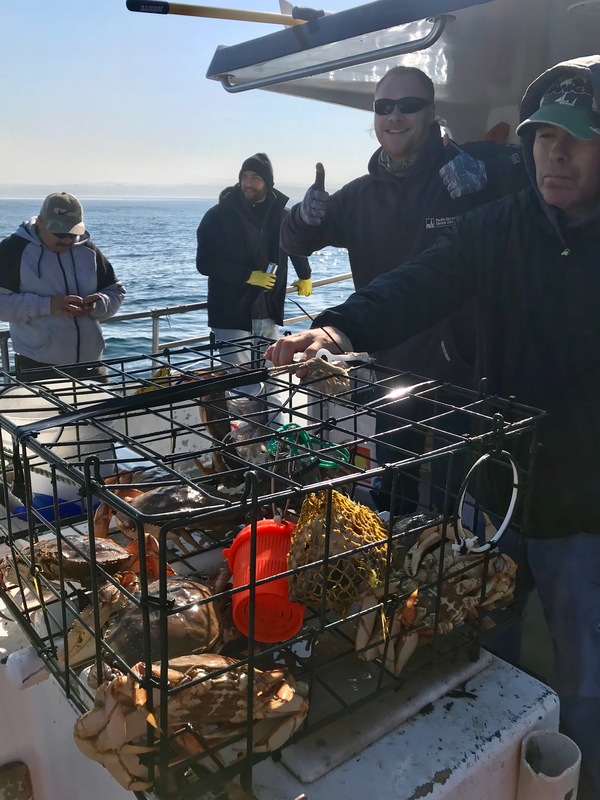 When we got to our string of pots we could see a whole mess of commercial crab pots all over our gear. We had several tangled crab pot lines and buoys throughout our entire string. There were at least a couple hundred commercial crab pots all over the place. We still ended up pulling 53 crabs for our efforts. 53 crabs for 7 people is a real nice haul.